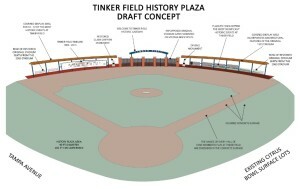 A draft concept for the Tinker Field memorial has finally been released by the City of Orlando. The draft concept is the subject of a community meeting tonight sponsored by Commissioner Regina Hill about historic Tinker Field. While many of the proposed features are positive, some will likely not be happy to see plans for only the small memorial, nor do they want to see any version of the old historic field in concrete. There are no other plans being released regarding the city’s use of the rest of the historic site, which the City Council defined as “2.3 acres of land and includes the described areas of the historic infield and outfield playing surface of Tinker Field,” in their ordinance. The mini plaza plans only call for a 90 foot diameter, or 282 foot circumference. This will make the memorial a downsized version of the historic field, as 90 feet is the actual distance between bases on a traditional baseball diamond. The “History Plaza” area will have a colored concrete surface and the names of every Hall of Fame baseball player who played at Tinker Field. The names will be embedded in the concrete surface. It will sit along Tampa Avenue and the existing Citrus Bowl surface lots, not where the actual historic playing field was located. In center outfield of the mini memorial, a “historic gateway” will welcome people to Tinker Field. Along the outfield, features of the proposed memorial would include a row of restored original stadium seats from the 1963 stadium, a restored Clark Giffith monument, a covered display area for 10-12 of the most historic events that took place at the field and a Tinker Field timeline covering from 1900 to 2015. There are also plans for a Dr. Martin Luther King, Jr. monument. Perhaps one of Orlando’s most historical moments took place at Tinker Field when Dr. Martin Luther King, Jr. spoke from the pitcher’s mound in 1964 during his only visit to Orlando. There will also be plaques highlighting the other most significant historic events at Tinker Field. The draft concept for History Plaza is at least a step in the right direction. Commissioner Patty Sheehan called a previous proposal for a Tinker Field memorial from the Orlando Venues a “weird baseball astroturf thing in the corner.” The Wells’ Built Museum of African American History is working with Commissioner Hill on the current memorial plans. The City has not indicated their plans for the rest of the historic Tinker Field site outside of the new mini monument plans. This may remain a controversial point, as many people in the “Save Tinker Field” movement want to see baseball return to the historic field and they do not want anything resembling a gravestone for Tinker Field. The group successfully fought City Hall on plans to originally turn the original playing field into a paved parking lot. However, the City of Orlando has been using Tinker Field as a parking lot for Citrus Bowl events and even put a liquor bar on the historic pitcher’s mound during this year’s bowl games. These controversial activities on a historical landmark by the Orlando Venues will likely continue. Concerts and festivals will also continue to take place on top of the historic playing field. Commissioner Hill’s community meeting regarding the proposed plans for Tinker Field is the second public meeting for the historic landmark, aiming to commemorate more than 100 years of history at the site. 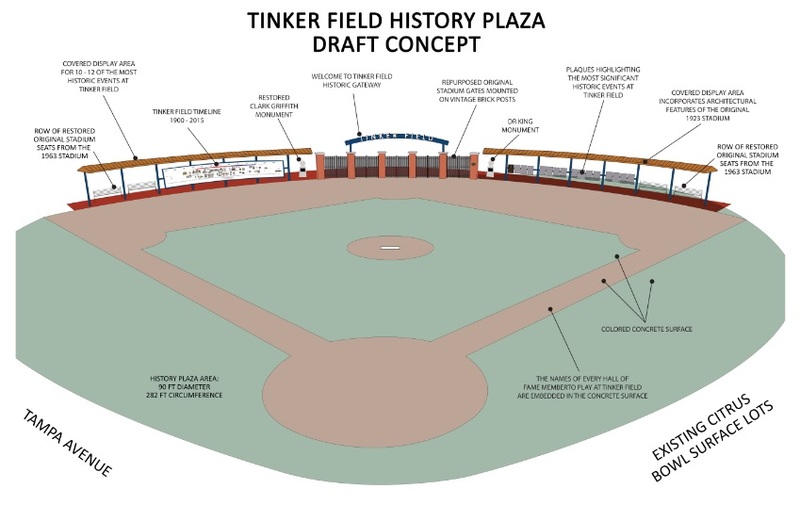 Check out the full draft concept for Tinker Field History Plaza below. For a panorama, 360-degree view of historic Tinker Field prior to the city’s demolition, click here. I also previously proposed to City Commissioners and the Mayor a plan to keep Tinker Field as a living historical landmark. 2 Responses to "Draft Concept of Tinker Field Memorial Presented by Commissioner Hill"